Özden Bilen, Turkey and Water Issues in the Middle East (Ankara: Southeastern Anatolia Project, Regional Development Administration, 1997). Pp. 223. No price available. - Nurit Kliot, Deborah Shmueli, and Uri Shamir, Institutional Frameworks for the Management of Transboundary Water Resources, vol. 1: Institutional Frameworks as Reflected in Thirteen River Basins, Water Research Institute (Haifa: Technion; Israel Institute of Technology, n.d.; 1997). Pp. 427. Paper. No price available. - Nurit Kliot and Deborah Shmueli, Institutional Frameworks for the Management of Transboundary Water Resources, vol. 2: Building Institutional Frameworks for the Common Water Resources: Israel, Jordan and the Palestinian Authority, Water Research Institute (Haifa: Technion, Israel Institute of Technology, n.d.; 1997). Pp. 116. Paper. No price available. 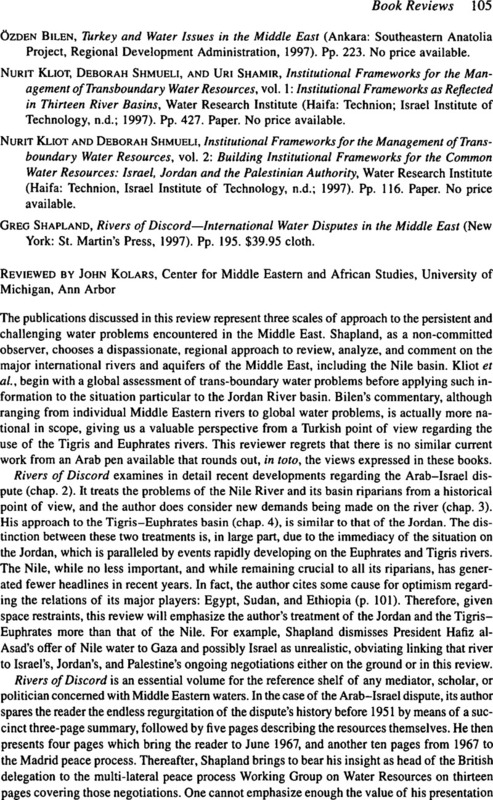 - Greg Shapland, Rivers of Discord—International Water Disputes in the Middle East (New York: St. Martin's Press, 1997). Pp. 195. $39.95 cloth.